It has been raining cats and dogs for more than three days now. As denizens of Metro Manila and its neighboring towns, we have gotten used to street flooding. Last Thursday's rain brought "instant" flooding that left many office workers and students stranded. We were lucky enough to get home before the streets to our place flooded. Friday dawned gray and rainy. By noon, our street was flooded. I was not a bit worried as the flood water only reached about 4 inches as shown in the picture. 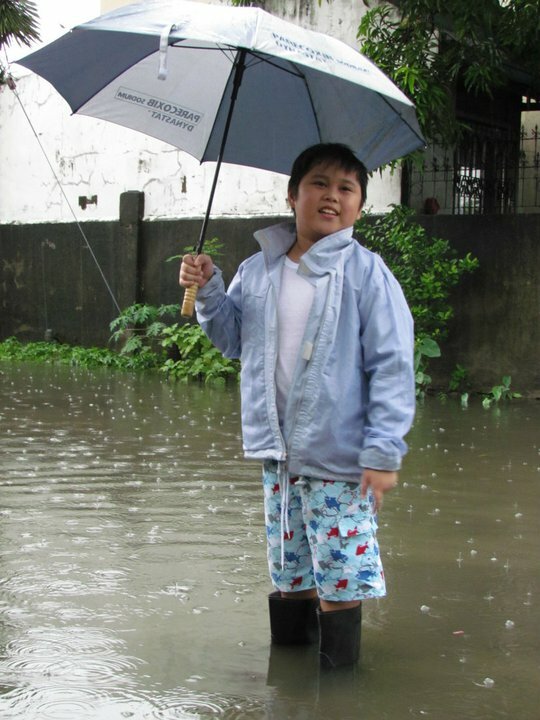 D3 let Ethan "experience" walking in the flood waters. By 9:00P.M.the flood water was about 2 feet high. This was when I decided for Ethan and Tabitha go to "higher" ground,i.e. my sister-in-law's house. There was so much to bring..sterilizer, feeding bottles, clothes, baby's linen and pillows, sterilized water, milk powder, baby carrier-and these are only Tabitha's!I thought it would have been better to just hike up a trailer with a trailer hitch to carry all the stuff. But at 11:00 P.M., with 2 feet high flood water on the street, raining hard et al, all I wanted was for the kids, D1 and D4 to get going to reach "higher" ground.